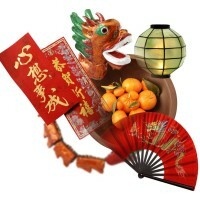 Home » Nutrition » Healthy Eating » Chinese New Year – Healthy Eating Tips! • Red colored foods bring you blessings throughout the year, so red foods such as apples, pomegranates, and blood oranges are a must in Chinese New Year! • Golden/yellow colored foods such as apricots, candied tangerines, peaches, yellow peppers, pumpkin, and yellow squash bring you great fortune! • Nuts and foods with seeds such as pumpkin seeds (pepitas), sunflower seeds, peanuts, walnuts, pine nuts, hazelnuts, chestnuts, pine nuts, and pecans are symbols of wishes for a good harvest! Based on Chinese Zodiac, 2012 is the Year of the Dragon! Dragons are active, passionate, confident, brave, and energetic, just like the Super Crew®! Encourage your children to start out the Chinese New Year eating lucky-healthy foods so they can be as strong and active as a Chinese Dragons! « How Should I Eat? A Quick Guide. Comment on Chinese New Year – Healthy Eating Tips!